Robometricschool. 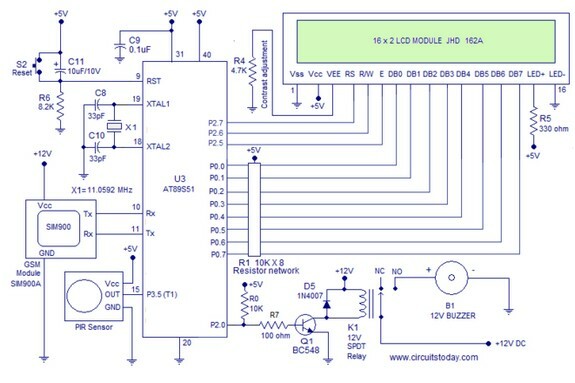 - This is circuit schematic of PIR sensor based burglar alarm using 8051 with SMS alert like in Figure 1 below. With this article we will give you global description about this electronic circuit schematic and also some component parts of this Circuit Schematic PIR sensor based burglar alarm using 8051 with SMS alert. Electronic circuit schematic like in Figure 1 above is Circuit Schematic PIR sensor based burglar alarm using 8051 with SMS alert. According Circuitstoday site describe that the GSM module communicates with the 8051 using serial communication. Tx pin of the GSM module is connected to Rx pin of the microcontroller (pin10) and Rx pin of the GSM module is connected to Tx pin of the microcontroller. Output pin of the PIR sensor is connected to P3.5 of the microcontroller. Data pins (D0 to D7) of the LCD module are connected to Port 0 of the microcontroller. Each pins of Port 0 are pulled up using a 10K x 8 resistor network. Port 0 of the 8051 is open drain and has no internal pull up resistor. So we need external pull -up resistors to make it work properly as output pins. Control pins (RS,RW and E ) of the LCD module are connected to P2.7, P2.6 and P2.5 of the microcontroller respectively. The LCD module we are using here is JHD162A. Read this article, Interfacing LCD module to 8051. Resistor R4 is used for setting the contrast of the display. Resistor R5 limits the current through the back light LED of the display. For more information about Circuit Schematic PIR sensor based burglar alarm using 8051 with SMS alert you can read more from the original source using link here.